Watercolor classes beginning Tuesday from 1:00pm to 4:00pm, Sept. 30th thru Nov 25th. 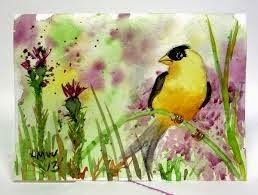 Class description: We will explore a variety of techniques and procedures used in transparent watercolor painting, such as direct & indirect painting, washes, negative painting, etc. The course will include instruction in composition (design principles,) color theory, and the use of values to create contrast. Instructor is Debbie Aken, fee $80 for 8 classes. Come into Ye Olde Art Shoppe to sign up and pick up syllabus for the class. Any questions call 541-863-6843.